Just like you, your dog is going to need travel gear. Pack according to your intended activities. For instance, if you’re going to be boating or paddle boarding with your dog, he should have his very own life jacket. A hiking excursion will necessitate a dog backpack, which will allow him to transport his own snacks and first-aid kit. 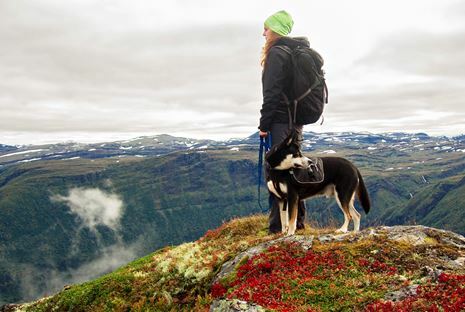 This backpack should be equipped with a grab handle so that you can keep your dog within arm’s reach in areas of rough terrain. When your outdoor plans last all day, make sure to bring plenty of water just for your dog. A gallon jug and portable dog bowl is perhaps the most convenient method, and will keep you from scrambling to find a store that may not exist depending on how far out your journey takes you. Throwing a Frisbee and frolicking in the waves makes for great memories, but you have to keep your dog safe from the dangers that abound at the beach. Animal Planet suggests keeping a blanket on hand so your dog can take a break from the hot sand when needed. Remember that dog-friendly beaches are dog parks, so you will need to practice dog park safety and keep your dog tethered to you unless you are in a designated office-leash area. Even if he’s able to roam free, keep an eye on him at all times, and always stay close enough that you can reach him and pull him to safety within seconds should he find himself in danger. Finally, don’t forget the sunscreen, as dog noses and exposed skin (like on their bellies) can burn easily. If you’re hitting the beach or hiking trails, chances are you will transport your dog on your own. But if you decide to stay in the city, you may need to rely on public transportation. Many metropolitan areas in the United States allow dogs of all sizes, provided they fit in a carrier. If you’re traveling throughout Europe, PetTravel.com says that muzzled dogs are typically allowed on trains in England, Scotland, France, Italy and Germany. No matter where you set sail, you will need to take safety precautions if physical activity will play even a minor role in your trip. Always be aware of potential dangers to you and your pet. This may include poisonous plants along hiking trails or jellyfish near the shore of your favorite beach. Never allow your dog to wander unaccompanied outside of a secured space, and even if he doesn’t need to be on a leash (like when you’re in your hotel room), always keep his collar or harness safely fastened on his body, complete with your contact information and his rabies tag. There’s nothing better than having a fun, active and memorable vacation with your furry friend, but remember that a little preparation goes a long way. Pack for all of your planned activities with Fido, and call ahead to make sure your canine companion won’t cut your vacation short before it starts.